We’ve sold half a million of the things just this month. Thanks to everyone who’s joined us on this extraordinarily weird journey – you’re all brilliant. This is becoming an annual tradition: Matt Timmons Brown, one of my favourite 15-year-olds, has made us another celebratory video. (Here’s last year’s.) Thank you Matt! WATCH FOUR YEARS OF PI HERE: https://www.youtube.com/watch?v=nnLTrJ6YQ-o&feature=youtu.be Three years ago something changed my life. It cost $35. It was the size of a credit card and didn’t look like much at all. What was this mystical thing? It was, of course, the little British computer that could: the Raspberry Pi. Congratulations to your team !! Happy Birthday and thank you for the raspberry pi! All of them A, B, A+, B+, 2B! the full schematics for the B+ and Pi 2 ? Happy Birthday! A special thanks to Liz & Eben who have put some much care, love and daily determination in to something so good for so many people! Thanks Limor! We miss you guys. Congratulations and many thanks for all you have accomplished and especially, all the benefits you have brought to the educational community at large. The Pi 2, in particular, has some amazing possibilities that we are already actively exploring. Here’s to a continued excellent future! 48 61 70 70 79 20 42 69 72 74 68 64 61 79 20 74 6f 20 74 68 65 20 52 61 73 70 62 65 72 72 79 20 50 69 20 66 6f 75 6e 64 61 74 69 6f 6e 21 !!!! Happy Birthday to the Raspberry Pi foundation! Raspberry Pi made a huge impact on my life! It reawaken my sense of curiosity, wonder … tinkering has opened a world of unlimited possibilities and what I had learnt in Xenix, Unix … had never actually left me at all. Here’s to many more birthdays of Raspberry Pi and many many more to come. I am eager to wait for the next announcement. Happy Birthday Raspberry Pi team! Sorry to be missing out this year. Hope that you’re having a blast this evening. It’s a shame it had to happen in conjunction with our celebration, but Leonard Nimoy passed away on Friday, who was the actor who played Spock on the original “Star Trek” TV series and in the subsequent movies, among many other roles over the years. Many of us who witnessed the opening monologue in the pilot episode live in 1965 had their lives changed forever as we were to “boldly go where no man/one has gone before”. I can say with authority that exactly the same thing started at 6 AM GMT on February 29th of 2012 for what is now an unbelievable number of us that must now be at least a million, and we’re just getting started with the Pi 2, which is putting the Pi on the “stick” part of the hockey stick growth curve. I believe I saw a Pi equipped with a sandwich on wheels in one of the many very enjoyable and reminiscent clips in Matt’s magnum opus video, and the music is more than infectious. So, the Pi has arrived and I’m getting an exponentially-growing number of requests to educate people about it. Happy Boithday (as we say in “Joisey”, where I grew up) and “Live long and prosper” indeed, our very best Pi friends and family! Remember wakeup at 5AM for the gran opening. The website crash… it’s been 3 years… time goes by fast. I have 40 PIs with 3G modem for remote support. WOW! 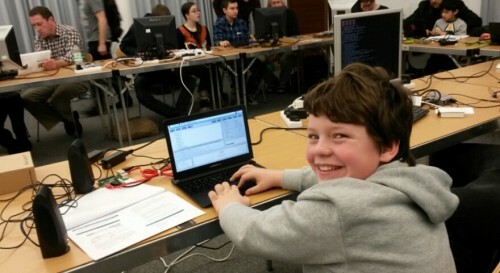 what a day, 3D printers, tetris, hampster cam, naughty/nice detector, pizza, robots, chocolate pooping rabbit, space invaders, thermal printer, swag, cake, minecraft, game of life, scratch, ISS detectors, scratch connecting to GPIO pins to control traffic lights, soldering, jazz played via a lava lamp web cam, more robots, srcatch games, parcel the parcel where everyone was a winner of some really cool and totally random stuff, free drinks, did I mention 100s of pizzas? not to mention all the great staff and volunteers. And the kids second favourite (after space invaders) the really useless machine, they were conviced if they pushed the button enough times it would be unable to turn itself off. Thanks to everyone for making it such a great day!! 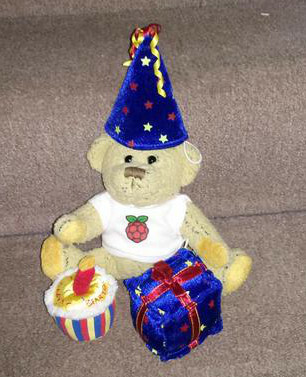 Happy Birthday Raspberry Pi. Hope everyone is having fun at the Birthday Party. Looking forward to seeing all the photographs and blogs. Great video Matt! Brilliant overview of how “diversely” (is that a word?) the Pi is used. happy birthday guys, sorry I could no be there! Happy birthday! And may the force be with you! Happy Birthday to each and every person who have brought us the Raspberry Pi. You should all be proud. Having commissioned more than 40 Pi’s it’s been a wonderful three years. PS, much better than the Punch Cards I started with at University. All the best from Tony in Australia. Happy Birthday Raspberry Pi ! I have been enjoying the ride so much and judging by the numbers i’m really wondering if we are witnessing a real shift in computing and internet. Are you the one who are going to be abble to give some flesh to the old dream of a really decentralised internet ? I mean, how many of those Raspies are now turned into small server ? At the beginning i was wondering about the lack of on/off switch but as server it makes so much sense. Congrats you have done a fantastic job ! So Happy With My Pis (7 pi family with one rev02 board) … Thanks and cant wait for more!! P.S. I’m so looking forward to blog posts / photos / video of your party over the coming week! What an amazing gig! Aaron and the live guitar – I stood there in awe for ages. And the Raspberry Pi beer – yummy, and the throne, wow! What a fantastic experience. Looking forward to the first (true) birthday next year. Oh, did I mention the pass the parcel and goodie bag? Thanks to Mike and Tim and everyone under the covers for organising such an amazing event. Oh, and Happy Birthday RPF! Wow. Just wow. Bon anniversaire & félicitations to all involved from near or far. The adventure is only getting started. About to fly home after an amazing weekend at the party event. See you all soon! Impressive numbers, though modest against the likes of Apple. However the devs in that quarter are playing with UIWatchKit and UIHomeKit and UIHealthKit, and the piece of the puzzle that is missing is a Pi-like hardware interface. Many believe it will be the next gen Apple TV. They may even make it hackable in a cute sort of way. Given The Woz’s public excitement some months back over the R.Pi, I would say the market research eyes are looking v-e-r-y closely indeed from cupertino right now. Anyway never mind the quality, feel the width and have some more cake. and there won’t be a single one per house . I Think they’ll make light switches ( 110v – 240v right there ) for every room that needs “thingternetting” with GPIO tucked safely in the wall cavity, & they’ll work in distributed fashion. We were only able to get to the party on Sunday, but it was great to come down and see some of the projects and learn more about Sonic Pi etc. Well done to Mike and all the others that had obviously put a lot of time and effort into organising the event. It was extremely well organised. Thanks! Great raspberry pi powered cars in the video! Happy birthday! I am so glad that I can own my raspberry pi at its 3 years-old birthday. The link to TinyBASIC for Raspberry Pi (at http://www.raspberrypi.org/tinybasic-for-raspberry-pi/) is broken. Has the download moved, or is no longer available? BTW, sorry to ask this here… I wasn’t able to comment on the original post, and there does not seem to be a way to contact you other than by commenting on a blog post. All change: meet the new MagPi!